I am very pleased to share that Jordan and I are finally Fee Free! We closed our joint chequing account with CIBC now and have moved all of our day to day banking with ING Thrive, complimented by a suite of savings accounts! As we had three unlimited accounts with CIBC, this will save us $467.64 a year! My personal credit card is a zero fee and is still with CIBC and I also have two RRSP GIC's with them. One matures in 2012 and the other in 2013. As they come up, I will transfer them to ING as well so I can eventually eliminate them all together. Thankfully, Jordan hadn't put his RRSP's with CIBC into a GIC yet, so he has sent in the request to move them over. If you haven't made the switch yet, I would highly recommend it! Feel free to use my Orange Key and you and I will both get a free $25 from ING if your first deposit is at least $100. After much deliberation, Jordan and I are excited to share that we are now looking at building a home of our own rather then buying something that is 30-60 (+) years old and needs a tonne of work! In the end we'll probably spend about the same, but have less work that we need to do right away. This is a huge advantage for us in this particular time of our life. We're looking at building in a community that is just outside of the city which will give me small town peace of mind when we start to have kids in a few years. The commute is about the same for me and Jordan a little bit longer - so no problems there. Building also gives us a financial advantage in that the home wouldn't actually be ready for possession until September/October of this year - so we have more time to save $$ and have a fabulous wedding in August. We put $1,000 (refundable) lot hold last night and now have a couple of weeks to negotiate the purchase agreement. Has anyone every built/bought brand new? Any words of advise? This is Aries and her $20 bone - she loves it! So, we almost bought a house over the weekend. For those of you who follow me on twitter (or talk to my mom on a regular basis) - know that it's been a crazy couple of days. We put in a conditional offer and then the house failed the inspection - HUGE FAIL. Basically it needed all of the large components replaced w/in twelve months time: furnace, water heater, roof, slope of the landscaping, cracked foundation, wood stove....you get the picture. Last night we took a night off and went to the Flames vs. Stars game, had a fabulous time! This was part of Jordan's Christmas present, so it was nice to finally get to go. My parents are probably coming into town this weekend, so it'll be nice to spend some quality time with them. We're also looking forward to getting back on the house hunt! I started writing this post by hand as a journal entry. I've been pretty stressed out lately and was writing out everything that was going and in my life and what had led up to my big cry on Sunday night. I wrote for about half an hour before scratching it all out - I was only giving myself a stomach cramp by writing it all out - it wasn't helping. As I re-read it, I noticed a trend. Everything was about why "I'm" stressed, why "I" am so super busy. The thing is, is that I've always sort of operated in a bit of a self-centric way. Not in a selfish, entitlement way - but in a take on the world and get stuff done kind of way. Jordan wants to help, he wants to be a part of our life and doesn't think I need to do everything. That said, he's happy for me to take on what I love. He's 100% available to support me. I'm looking to make a change and embrace the help he's offered. I need to give up control and trust that he can do and will do what is best for us. Jordan asked that first I sort out what the priorities are so that he can take things on that will lift the most amount of weight off of my shoulders. I thought I might start by listing out everything that's ongoing in our lives. Jordan's in his second apprenticeship year out of three and goes to school until about 8pm every Tuesday night. Maintaining the house - general tidiness. I came up with that list without breaking a sweat, so it's entirely possible that there are more things going on. Of course with each of the things above their is a significant financial impact, which only adds to everything. I don't know how to prioritize these things - how to sort out what the most important is. I don't know which of these things to ask Jordan for help with. Since Sunday, Jordan has already taken a more active role in the house hunting project. He's been in touch with the Real Estate agent on some properties we had looked at and about some ones that we are interested in looking at when I get back to town. He also had a bunch of rock chips in the Escape taken care of, which is fabulous! How do you handle all the things that life throws at you? Do you have any suggestions for how to sort out what to ask Jordan to take on? Unfortunately I don't think he can go to Yoga for me or study for my CHRP for me. Yesterday I posted our sixth monthly spending summary since we started tracking our spending using our credit card statements. Today I want to write about our eating out trends. It is the biggest and the last significant area for improvement we have in the way we handle our variable spending money. 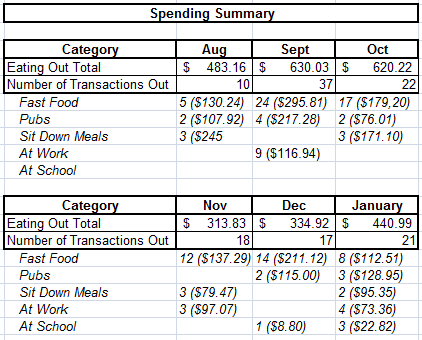 It's a little hard to read unless you click on the image above, but our average eating out spending is $470.53. Our low was $313.83 and our high was $630.03. Of course our groceries have never been as high as we expect. 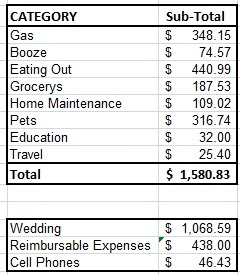 I budget around $400 and we spend, on average, $250. Of course we know these things are correlated, but I'm not foolish enough to think that the solution is just to buy more groceries. - how often are we eating out, and what meals? Let's take this on one step at a time. When eating out, we most often choose a fast food restaurant or gas station pit stop. This eats up (ha-ha) a significant part of our budget. We spend $150-$300/month on crap - it's not even justifiable crap like - we went out for a social gathering, or we bought our parents dinner. It's food we stuffed in our mouths with as little health benefits and high caloric intake for no reason other then we were in a hurry. hmm....a pause for consideration on that. We need to eat before we leave the house. EVERY TIME. Not only will we get less cranky with each other (we get cranky when we're hungry) - but we'll spend less money. On average, we go out to a pub with friends twice a month. This is a social activity with friends, often involving a few drinks, wings, and a sports game. I don't think that spending time with friends twice a month is unreasonable - how do people watch their pennies when at a pub? On average, we go out for a sit-down meal about three times a month. This may be just Jordan and I having a 'date' and/or it may be when we're visiting either of our families. We don't always buy and hopefully neither do our parents always buy. For example, the last time we were in BC visiting my parents, my mom came to meet the wedding DJ with us. Jordan picked up the tab for the three of us - I want our budget to be flexible enough to do this. The 'at work' number of transactions are a bit deceiving because up until two months ago Jordan ate of the catering truck that came by the shop regularly, but only paid twice a month (on pay days). We did really well in December, and then in January I ate out three times and Jordan put a work lunch on the MC (he got cash back from mostly everyone). We're doing bagged lunches now, just about every day and I'm really proud of our progress here. Another area to improve is eating out while Jordan is at school - It's a long day for him 7-7pm and so we need to pack bigger lunches and easier food to eat on the go (does anyone have tips on 12 hour day lunches/meals). So, that's the breakdown of our eating out - It's often an area that gets a lot of comments when I post our monthly spending summary, so hopefully this will engage you in a more specific conversation about where to make improvements. This is probably going to be a long post...there are a lot of financial updates to share. I'm really proud of our booze spending, we cut it down significantly from every month previous since I started doing these reports! Hopefully we can keep this trend going. We were strong the first two and half weeks for eating out and then bombed the last couple weeks. It didn't help that we made a trip to BC and went out a couple of times there and in the city with friends. Pet's is abnormal but reasonable considering our recent adoption. Education/Travel are as per norm. I've pulled out the wedding, reimbursables and the cell phone as these items are not part of the MasterCard Budget - there is money set aside for them already so don't count for the intention of this summary activity. We're in the middle of switching banks from CIBC to ING Thrive and so I borrowed money from our savings funds as place holders in both accounts until all of the changes have taken place. We didn't want to risk having a bounced payment if we closed an account to soon or assumed a vendor received our change of banking information request. Once the car and truck insurance payments go through, we'll be able to close CIBC for good (with the exception of my personal Visa and two RRSP GIC's). One of our roommates successfully moved out at the end of January and we fully refunded his damage deposit. We then re-worked the budget based on our increased portion of the rent and utilities. This budget also reflects the insurance adjustments we made with the purchase of the Escape and reducing the coverage on Jordan's truck as it's no longer used more then 5 times a month. Jordan also recently changed his cell phone plan and we expect the bills to be less. We are ever striving to balance the MasterCard spending and are getting closer each month. The wedding is our current savings priority but that is now competing with the house. So while this is our savings budget, there may be some adjustments as the weeks progress. I'm leaving to Ontario for another work trip this afternoon and won't get back until Thursday evening. I feel like I'm being pulled in all sorts of directions lately so hopefully this time away will let me reflect and prioritize everything that's going on. I had a good talk with Jordan last night who wants me to ask for help when I need it, so I need to figure out what I need.